Bread and Puppet's cardboard and paint Rotten Idea Theater Company takes on the Egyptian spring. Filmed by David Swanson. Filmed by David Swanson. 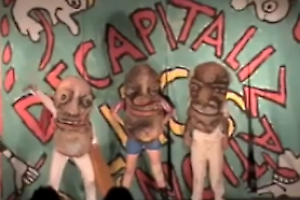 The Bread and Puppet Theater is based in Glover, Vermont. Each summer they perform on Sunday afternoons. The museum of puppets is open from June until October.